…of my relationship with the best city in the whole world. Unfortunately, this means that my Amsterdam cultural baby is being delivered right around the time I have to leave. This baby is just metaphorical, I don’t have some great project to present or token of my time abroad. I’d say what was birthed may just be a new Lily; an older one (no avoiding that though…) and a more tolerant one but at the same time a more stubborn one. Stubborn in the sense that I, in no way, will settle for anything less than extraordinary after what I’ve had the opportunity to experience here. The world has big things in store for me and might have always had, but only now do I realize my purpose and the extent that I can take my capabilities. I know I just said that I don’t have a token of my time here, but that was a lie. 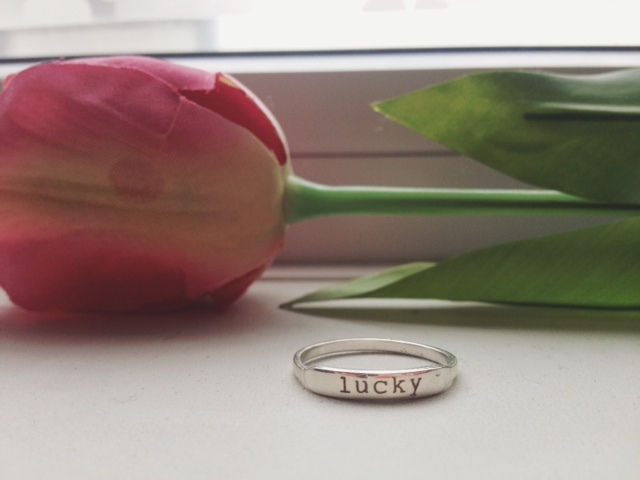 I did buy myself a ring from one of my favorite stores last week (unaware of this significant date, the anniversary was technically yesterday), engraved with “Lucky.” I do hold myself (and my family) as the prime reasons for pursuing the opportunities I’ve had in life, but those opportunities had to have come to me with a bit of luck. And the fact that I do get to pursue them makes me truly, truly lucky. One of my most influencial English teachers at Hockaday, Kyle Vaughn, shared this poem with us and it has stuck with me for years after: Lucky Life, by Gerald Stern. The last two stanzas replay in my mind over and over again. Oh Lucky life, oh lucky, lucky life. and there are moments of peace, and pleasure, as I lie in between the blows. but have my own hills and my own vistas to come back to. the year my tooth brought misery to us all. the car onto the sand and looked for the key. on the porch with coffee cups shaking in our hands. one hand and a compass in the other. and reading the funny signs over the bottles. with a whole new set of friends, mostly old and humorless. Dear waves, what will you do for me this year? Will you drown out my scream? Will you let me rise through the fog? Will you fill me with that old salt feeling? Will you let me take my long steps in the cold sand? the black clouds with the blue holes in them? Will you let me see the rusty trees and the old monoplanes one more year? and move the kites and the birds around with my dark mind? Lucky life is like this. Lucky there is an ocean to come to. Lucky you can judge yourself in this water. Lucky you can be purified over and over again. Lucky there is the same cleanliness for everyone. Lucky life is like that. Lucky life. Oh lucky life. Oh lucky lucky life. Lucky life.